Rumours about the fate of the micro condo building have been circulating since the beginning of the month and we finally got the official word late last week. Urban Capital has decided that Smart House will be cancelled and turned into a rental building. For those who have purchased, deposits are being returned. There is no information behind who is involved with the rental building, but we do know that it will not be sold unit by unit. Urban Capital will now turn the focus to the upcoming James Street Pub building which we expect to be launched late spring or summer 2016 at the earliest. Questions about buying pre-construction condos in Ottawa? Fill out the form below, I would love to chat. As a young professional who is working and living in Ottawa, only the best will do. Work hard, play hard is more than just a saying for you, it's your way of life. Last thing you want, are constant complaints from your neighbour because the walls are too thin, or issues with the condo board. With over 900 condo buildings across Ottawa, we have narrowed this down to a select few. 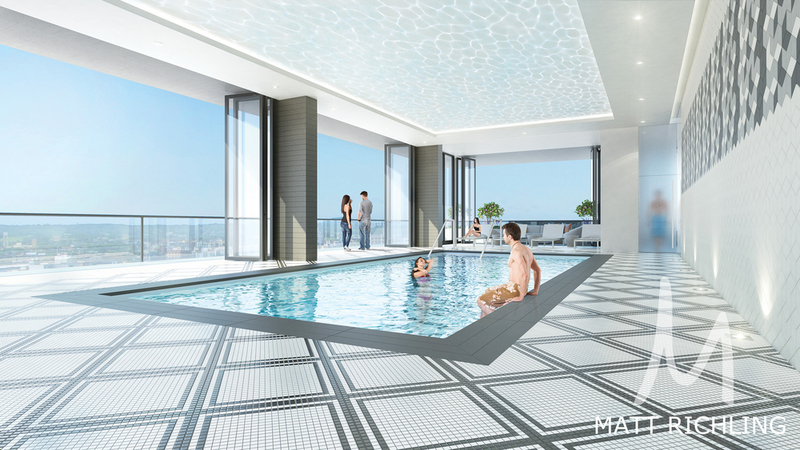 Mondrian, with its "rooftop" (6th floor) outdoor pool, complete with Miami-esq cabanas, large party room and concierge has been the choice of YP's looking for a place to call home. The units them selves are open concept and modern with floor to ceiling windows, exposed concrete pillars and columns, and decently sized. Great location for those working in the downtown core. Location: 324 Laurier Ave. West, at Bank st. Pool: Yes, Outdoors. Not for lap swimming. Party Room: Decent sized with large sitting area, kitchen, dining table, TV, and pool table. BBQ: Yes, shared. Also has outdoor dining table. Electric BBQ's allowed on unit balcony. Visitor Parking: None in building, paid lot beside entrance. Central Condos is a mix of three phases, 354 Gladstone and 349 Mcleod make up phase one (two addresses allow the large U shaped building to have two entrances, mailboxes, etc. ), 360 Mcleod which is phase 2, and the third phase which is under construction called Hideaway. Same feel and flow as the Mondrian, but 4 years newer, and reflected in the updated finishings throughout the building. Location: Bank st, at Gladstone St. and McLeod St. Pool: Outdoor pool in Phase 3, for residents of phase two and three only. Party Room: Each phase has independant room. Decent sized with large sitting area, kitchen, dining table, TV, and pool table. BBQ: Yes, shared. Electric BBQ's allowed on unit balcony. SOHO Lisgar is Ottawa's second for Mastercraft Starwood. Located at 300 Lisgar, the building is very central being just off Bank St. and only a few blocks from downtown offices, Elgin St, Byward Market, Little Italy and Chinatown. The high end finishes, quality design, and first class amenities are what one would expect with the Mastercraft Starwood name. "Timeless design, well thought out living spaces, style and flair are SoHo’s signature. We used the same high quality materials and standards demanded by our boutique hotel clientele – well-heeled jet setters, movie and rock stars, and C-level executives (CEOs, CFOs, COOs) – who demand living spaces equivalent to the comfort of expensive homes. For example, marble bathrooms with large shower stalls and rainshower head, a handshower with diverter, Floor-To-Ceiling and all-To-Wall Windows©, European appliances and Quartz countertops. A kitchen designed with fine cabinetry you would find on a yacht or private jet, with an island, and kitchen appliances concealed behind lacquered doors. Backsplashes with glass tile and a stainless steel sink with side mounted faucet finish this stunning kitchen. Pool: Yes, Outdoor pool plus hot tub. BBQ area: Yes, shared. Electric BBQ's allowed on unit balcony. Outdoor Entertaining: Yes includes an outdoor Kitchen and fire pit. Built by Canril Corporation, this five star building is located in the heart of everything. Launched with many high end amenities over and above, such as separate "gold key" concierge and separate security, BMW 7 series Li for short outings (driven by concierge), valet parking, grand piano in lobby, three high speed elevators, etc. 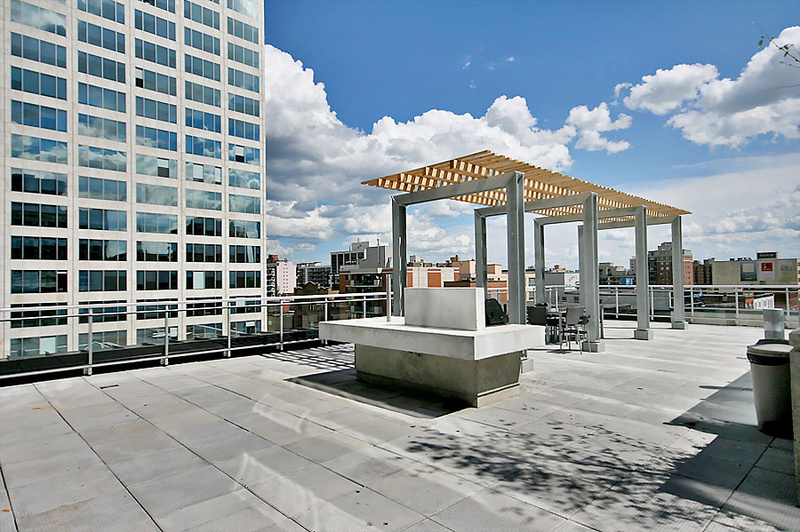 Built on a three storey commercial podium, the outdoor terrace which is approximately 9,000 sqft, owners relax, without leaving home. Did we mention the lobby is a BMW showroom, with models rotating throughout the year! Pool: Yes, indoor salt water pool plus hot tub. Photo from Urban Capital on Facebook. Smart House, from Toronto's Urban Capital took home three awards last night at the Ontario Home Builders Award in Ottawa. The awards were for the best website, best ad campaign, and best video! - Minto Communities was named Ontario Home Builder of the Year, for the second time in three years. - Oakwood Renovation Experts was chosen as Renovator of the Year. - Lagois Design won for Most Outstanding Home Renovation (between $250,000-$500,000). - Mattamy Homes was a finalist in the division for Best Interior Decorating of the Model Home in Half Moon Bay. Last night was the first VIP launch for Smart House Ottawa, being launched by Toronto's Urban Capital. The sales office saw lots of people throughout the night and we are being it it was a successful VIP launch. Approximately 10-15 units were sold last night at the VIP launch which is not yet open to the public. There was chatter about weather Ottawa was ready for micro condo living, but clearly we are. Will be exciting to see how sales go over the next few weeks, and how things go at the public launch (date still tbd). It was great to see David Wex (founder and partner of Urban Capital) in the sales office to chat about the project with potential buyers and past clients. Looking for more information on Smart House Ottawa? I would love to help! Smart House Ottawa, is claiming to be Ottawa's first micro condo building, with the largest units coming in at 586sqft for a two bedroom. Below are three out of the 18 units that are for sale in the building. Above is the A1 unit, which at 315sqft is the smallest suite in the building. Its launch price starts at $179,900. The C1 unit, which is the one bedroom and den, inside Smart House Ottawa. Above is the 519sqft C1 unit, which is the only one bedroom plus den floorplan in the building, starting at $314,900. The D1 unit, the smallest two bedroom inside Smart House Ottawa. Above is the 507sqft D1 unit, which is the smallest two bedroom in the building, starting at $275,900. 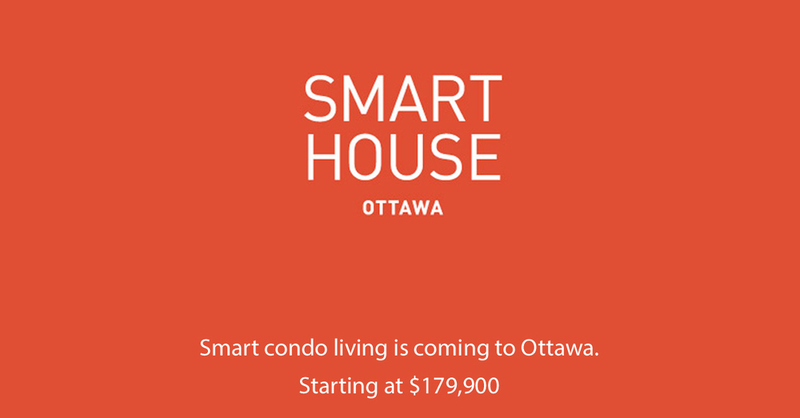 If you are looking for more information on Smart House Ottawa, check out the Smart House Ottawa landing page HERE. Birds eye view of the amenities for Smart House Ottawa. Creating an amenities space that acts like an extension of your unit, will provide you with much more enjoyment. At Smart House Ottawa, Urban Capital has done that, bringing features that you would expect and allow you to live, exercise, lounge, and be social, all while at home. Just because you live in a micro-condo doesn't mean your social life does as well. - All units will be individually metered for all utilities, allowing occupants to control their personal electricity, water, and energy usage. 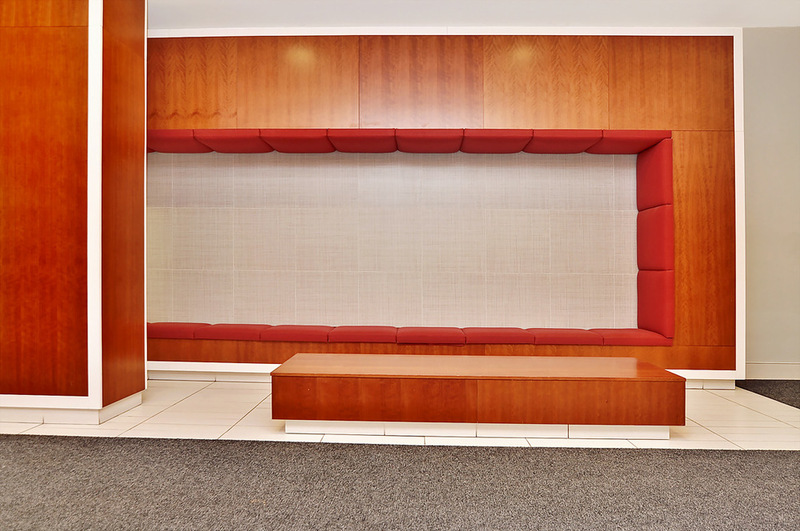 Step inside the units and you will understand why they are called "Smart" and space saving. By using high quality products that utilize space saving design, you are able to have that "big house feel" inside your condo. Using a fully-integrated Liebherr 24" refrigerator (the same ones used in SoHo Lisgar, and SoHo Parkway), Porter & Charles 12" two burner smooth cook top(when was the last time you used four burners at once? ), 1.5 cubic foot stainless steel microwave-oven, and Fisher & Paykel 24" single tall-tub dishwasher drawer - your kitchen has high-end european appliances right where you want them. Both the AEG architectural hood fan, and integrated cutting board, are both tucked away so you wont notice them. Even the European-style Porter & Charles 24" washer/condensing dryer is space saving, taking up a fraction of the space a normal set would use! When not in use, all you see is a modern clean space. Smart House Ottawa Kitchen was fully designed to save space and look good. Looking for advice about floor plans, views, pricing, etc? I would love to help you out, just fill out the form below. Hot off the press! Just got my new mini cards in! Features eleven of my favourite property photos from around Ottawa. Love them! SoHo, East Market, Mondrian, Claridge Plaza, Central, and a bunch of interiors. 383 Cumberland Sold in 3 days! After being listed with another agent for almost 12 months, the owner came to me out of frustration to help sell his small (532sqft) condo. Within three days of being listed, I had it sold. In this market, each property needs a custom marketing plan that will highlight the units strength and weakness for the potential buyers. When you need something sold, I am here to help. Want to chat about selling your home? Front page of the Homes section in this weeks Ottawa Citizen, chatting about a recent sale at Central phase 1 (354 Gladstone). Large Ottawa Condo Open House this weekend at Central Condos on Sunday from 2-4pm. All remaining condos in Phase 1 (349 Mcleod Central Condos Ottawa) will be available to view, which includes 1bedrooms, 2 bedrooms all with parking. This units are all from the developer Urban Capital and are brand new construction new been lived in with many upgrades, ready to move in. For more information contact Matt Richling at 613-286-9501, Kim Tran at 613-563-1155 or Anthony Donnelly at 613-563-1155. Features: New two-bedroom condo with stainless-steel appliances and hardwood floors. Includes parking and a storage locker. What’s good about the ’hood: Steps to shopping on Bank Street and in the Glebe, close to universities in an up-and-coming area. Starts 12 noon on Saturday Feb 18th and runs till Sunday Feb 26th! For more information contact the sales centre at Mcleod St just east of Bank or HideawayatCentral.ca OR just send me an email! From the main door entrance, this unit speaks elegance. Start by walking over the custom tiled entrance way and notice the high quality South Asian Walnut hardwood. 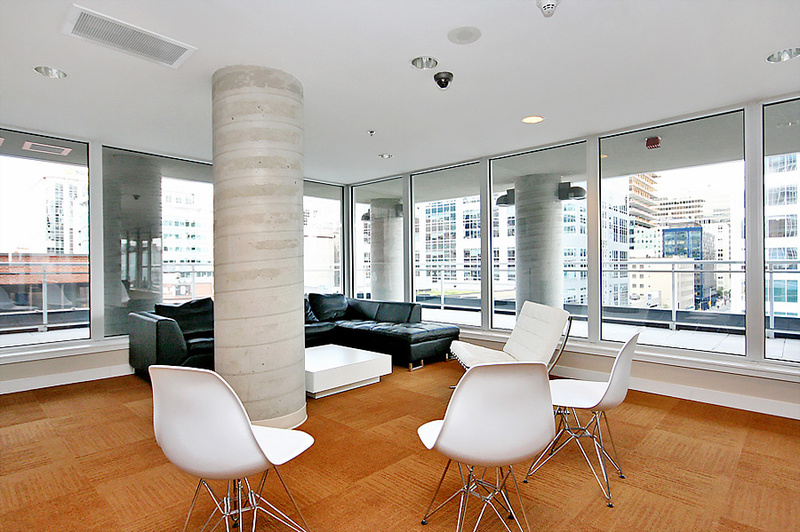 As you turn the corner you notice the stunning modern open concept loft unit situated in the heart of downtown. The living and dining rooms boast great urban views with floor-to-ceiling windows. The nine foot concrete ceilings and concrete pillars bring the urban beauty and unique touches that are rare to the city. Your tour has only begun. Welcome to the upgraded smart open kitchen. A few top notch features include: matching stainless appliances, Cambrian black granite, sandblasted glass mosaic tiled backsplash, Kohler “Vault” double square sink, Grohe Essence faucet, upgraded modern handles, LED under cabinet lighting. Not enough fridge space? Always the option to store your champagne and wine in the integrated under cabinet wine chiller. Watch a movie, or entertain in style with full surround sound controlled by the “Harmony radio frequency” remote. This allows all cables and A/V equipment to be hidden in the out-of-sight closet. The system controls your full equipment setup including: Cable Tv, Blue-ray Disc (including 3D movies and games), Apple TV, Sony PS3, XBOX.. and more. Relax in the fully upgraded bathroom featuring: custom Quartz counter, under-mount stainless sink, full wall mirror and accent damask wallpaper. Enter your master suite with a wall mounted tv and a full closet organization system that was designed to maximize your space. Located steps away from every amenity that is available in the By Ward Market. For those who require a vehicle, this unit includes a premium parking spot on the first floor in the underground heated garage located across from the elevator doors. This unit also features a premium storage locker. The East Market Lofts also features: a large fitness room complete with both free weights and exercise machines, large party room complete with outdoor patio and BBQ areas and games room with pool table and tvs. The unit also features efficient laundry (in-unit), full window blinds, large balcony, and two furnaces (one for each bedroom, both with heat and A/C). The unit is listed on the Multiple Listing Service for $369,900.